Intertops sportsbook has been on the market for decades. Their first website opened in 1998, and they have been running strong ever since. 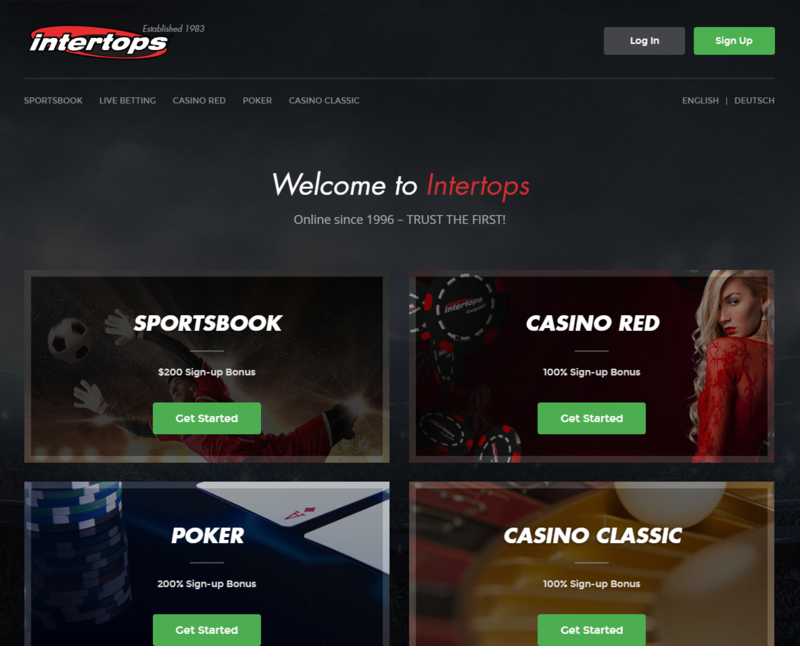 Intertops is a reliable betting partner that might seem old-fashioned at first glance, but that doesn't mean they are not following modern trends. They offer a wide variety of betting markets and they were a must-have betting partner in the US for years. In this review we will take a new look at them and see if anything has changed recently. Intertops sportsbook has been on the market for decades. Their first website opened in 1998, and they have been running strong ever since. Intertops is a reliable betting partner that might seem old-fashioned at first glance, but that doesn’t mean they are not following modern trends. They offer a wide variety of betting markets and they were a must-have betting partner in the US for years. In this review we will take a new look at them and see if anything has changed recently. Intertops deposit methods are limited, but the main options are supported. Bitcoin is our recommended method of deposit, with $10 minimum deposit and $1000 maximum. Visa and Master Card debit and credit cards are also supported. The minimum deposit is $20, while the maximum is $500. When it comes to withdrawals, we recommend using Bitcoin, which is the only free method. You can withdraw a minimum of $10, up to a $2500 per week. You can use paper checks as well, with $150 minimum and $3000 weekly maximum, but it costs $50. Bank transfer is the most expensive, with $150 minimum and $2500 maximum, but you have to pay $50 and bank fees. Intertops has been in the business for a long time, and they didn’t work on their interface as much as they should have. At first glance, the website looks a bit outdated, but the most important thing is functionality and speed, where Intertops excels. Also, their website is fully responsive, so you won’t have any issue if you try to access it with your mobile devices. Intertops odds are within industry standards, although you can still find some value that you won’t get elsewhere. However, when it comes to the number of betting markets, they are near the top of the industry. The reason behind that is a large percentage of their customers come from all around the world, so Intertops had to balance their offer. However, that doesn’t mean that US-based bettors won’t find what they are looking for; on the contrary, major American sports are covered as well as in other US-based bookies. Their minimum bet is only $1, so Intertops is a great option for casual bettors. Professionals won’t like the fact they have around $2000 limit for all major sports. Intertops offers three different bonus plans to their new customers. You can get a 200% matched first deposit up to $50, a 100% matched deposit up to $100, and a 50% matched deposit up to $200. So, the more you deposit, the better plan you’ll get. Intertops is also running a handful of promotions for major sports events such as the World Cup. Intertops is a website you must have as your betting partner if you are a casual bettor. Great welcome bonus and a wide variety of markets are major selling points of this sportsbook.